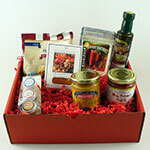 A beautifully packaged, carefully-selected collection of New England gift items, including regional food specialties, candies, soaps, soup, and a coffee mug. Something from each of the six states of New England. Perfect for welcoming visitors or new residents to the area. 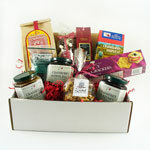 A great way to say thank-you to your host or partner. 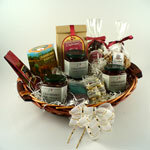 Whether for a friend, relative, business associate or client, our New England gift basket will be remembered and appreciated. A luxurious bar of soap in the shape of the state of Rhode Island made with fir needles. A luxurious bar of soap in the shape of a Vermont maple leaf made with fir needles. New England Chili Salsa 10 oz jar.